The picturesque Graslei waterfront in Ghent. Ghent (map) is a medieval city in the Flemish region of Belgium, located about an hour’s drive southwest of Antwerp and west of Brussels. In the 13th century, Ghent was one of the largest and richest cities in northern Europe, primarily due to its textile industries and trade. 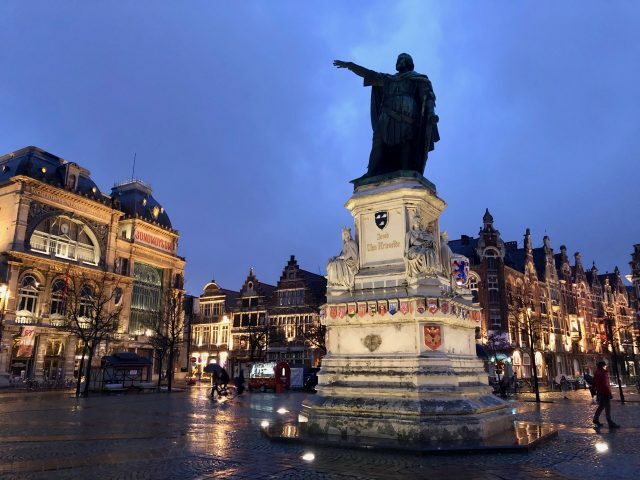 The city flourished and many historic buildings such as the St. Bavo Cathedral and St. Nicholas Church stem from this period. 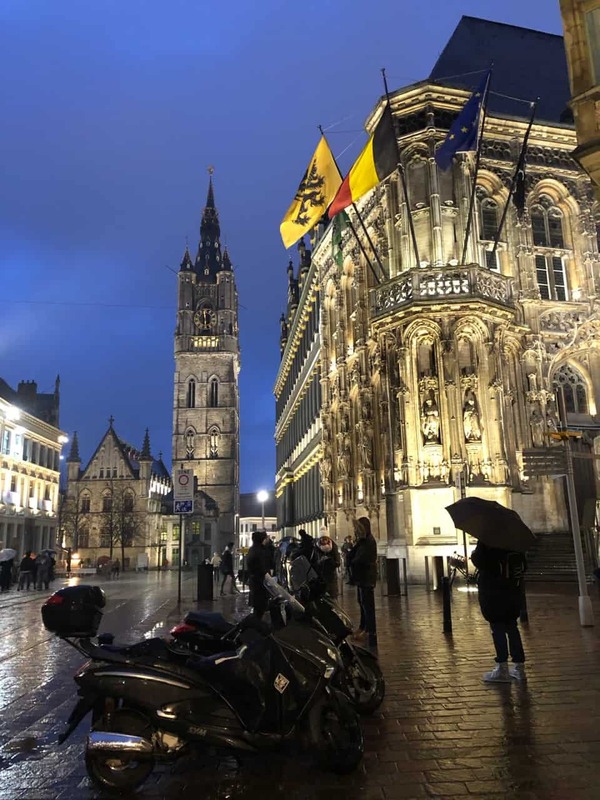 These days, Ghent is a vibrant university city with beautiful Gothic monuments, picturesque cobblestone streets, bustling squares, wonderful restaurants and lively pubs. 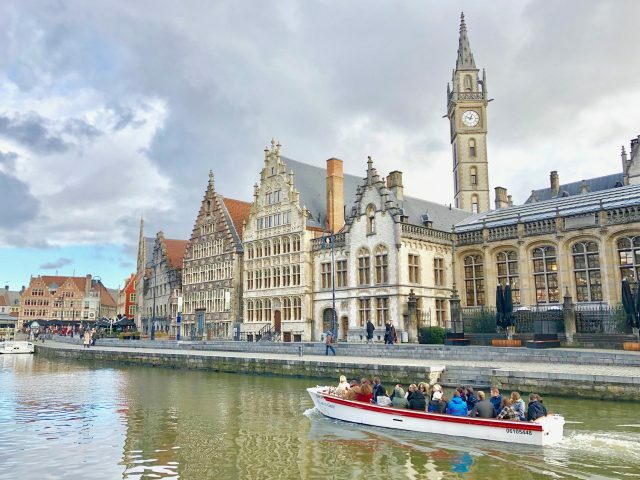 Many people visit Ghent as part of a day-trip from Antwerp or Brussels, which is a pity, because there are many things to do in Ghent. 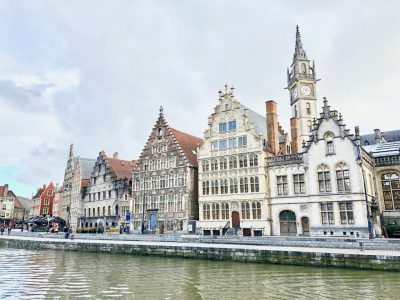 I recommend spending a few days or at least a weekend in Ghent to get a true flavour of the city. 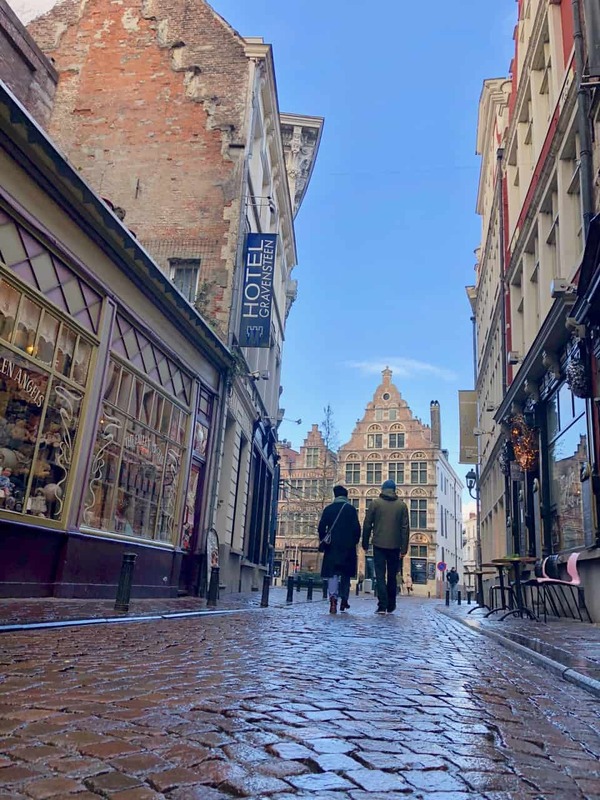 I spent a weekend in Ghent with my partner and despite the erratic winter weather, we had a great time strolling around the city, admiring the historic churches and canals, feasting on typical Flemish cuisine and drinking beers with the locals. 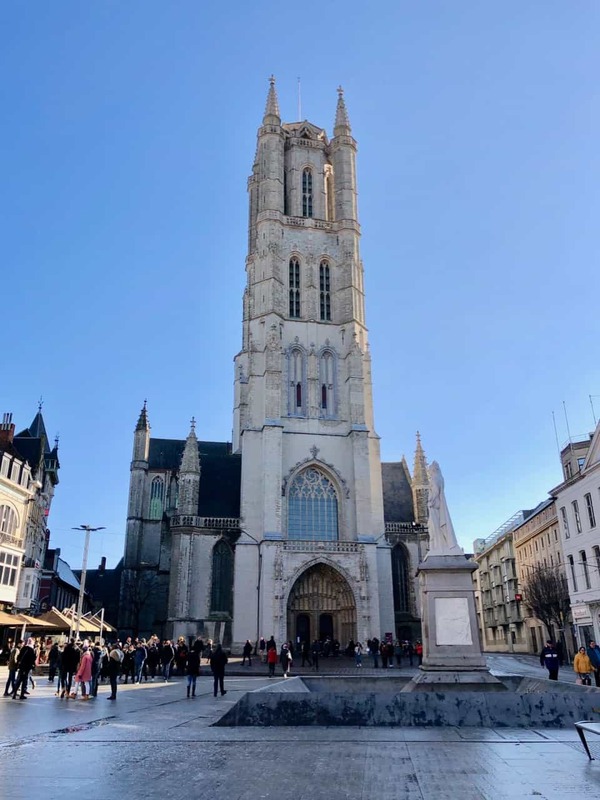 We stayed at the NH Gent Belfort Hotel which enjoys a very central location directly opposite the stunning Ghent City Hall and a stone’s throw away from the UNESCO World Heritage listed Belfry of Ghent. The hotel has comfortable rooms and serves an impressive breakfast every morning. 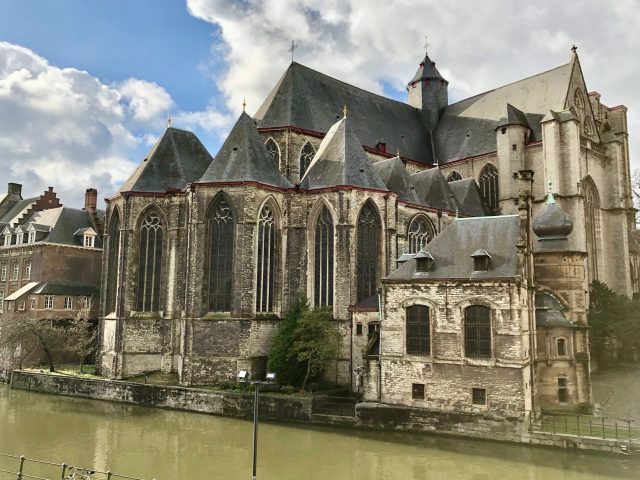 All the major attractions in Ghent are within walking distance of the hotel. The Belfry of Ghent with the St. Nicholas Church in the background (left). The medieval city centre is compact, making it easy to explore on foot. 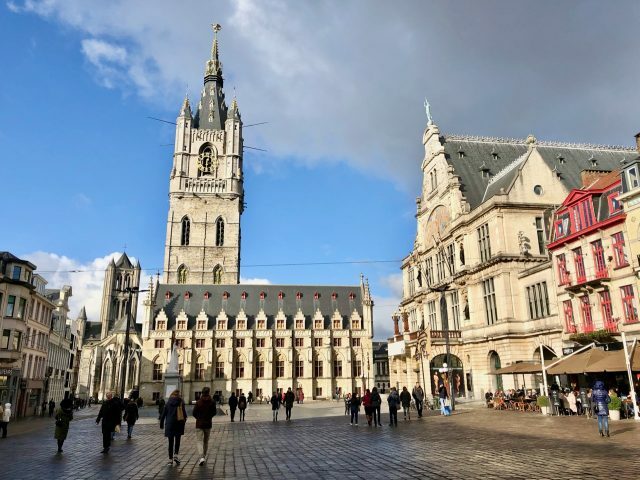 From our hotel, we crossed the road to admire the stunning 16th century Gothic and Renaissance façades of the Ghent City Hall before continuing on our walk. The Gothic façade of the Ghent City Hall by night. The Belfry can be seen in the background. 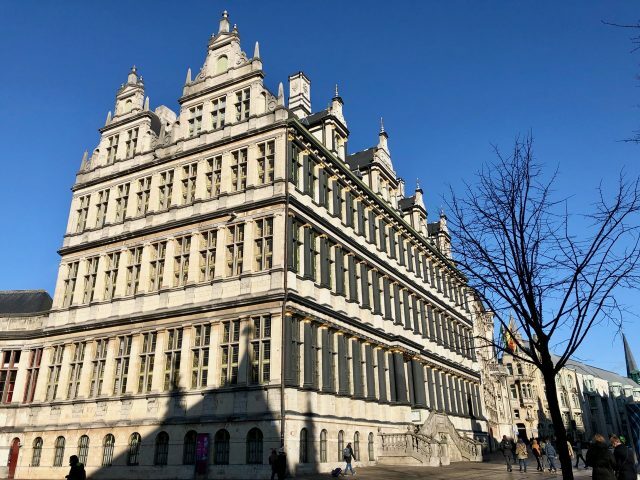 The Ghent City Hall – the Renaissance side. 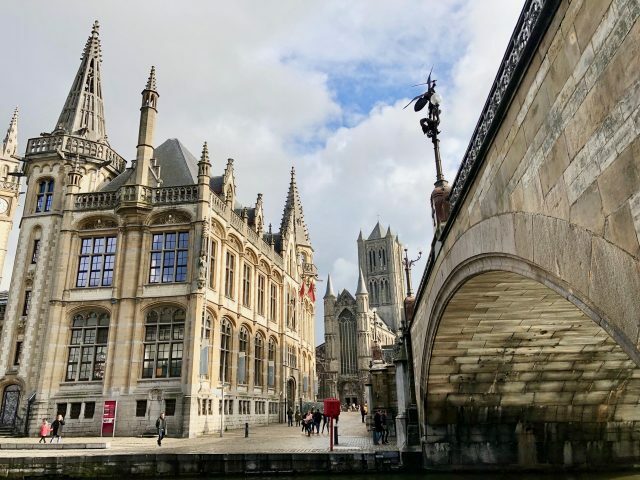 The major sights in Ghent include the 14th century Belfry of Ghent (the tallest belfry in Belgium), the 13th century Saint Bavo (Sint-Baafs) Cathedral, the 13th century Saint Nicholas (Sint-Niklaas) Church, the formidable 12th century Gravensteen Castle (Castle of Counts) and the splendid Graslei waterfront (with its gorgeous houses). St Michielsbrug or St. Michael’s Bridge. Vrijdagmarkt or Friday Market Square by night. 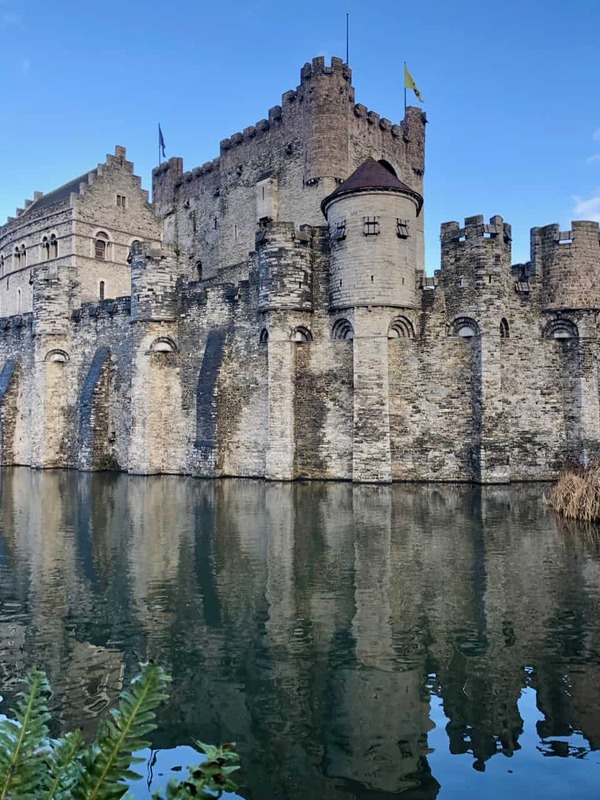 Gravensteen or the Castle of Counts. For fans of Modernist architecture, don’t miss the Boekentoren (Book Tower) at the University of Ghent. Built in the 1930’s, the Boekentoren was designed by Henry van de Velde, a famous Flemish architect and one of the founders of Art Nouveau in Belgium. He also played an influential role in the early days of the Bauhaus movement in Germany. Strolling around along picturesque cobblestone streets in Ghent. In addition to strolling around the city, one great thing to do in Ghent is to join a canal cruise. You can join one of these cruises at the Grasbrug. Avoid queues and purchase a (cancellable) ticket here. A leisurely canal cruise in Ghent. 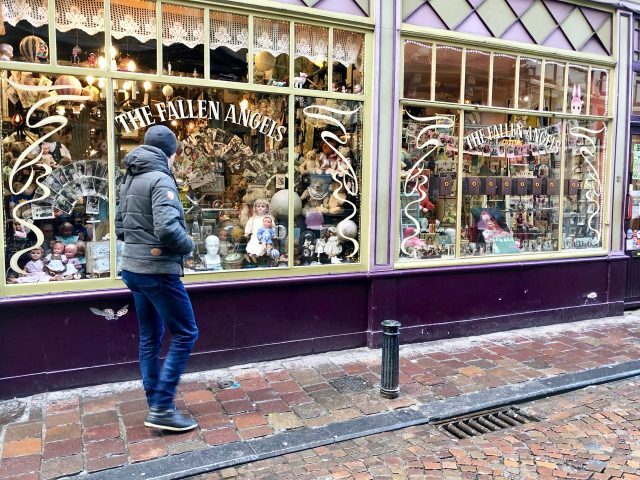 One thing that quickly struck me as we strolled around Ghent was the number of interesting shops selling all sorts of quirky merchandise, memorabilia, modern design and antiques. We also visited the market inside the St. Nicholas Church, which is a treat for antique lovers! And there are also many shops selling world-famous Belgian chocolates! One of the shops I loved! 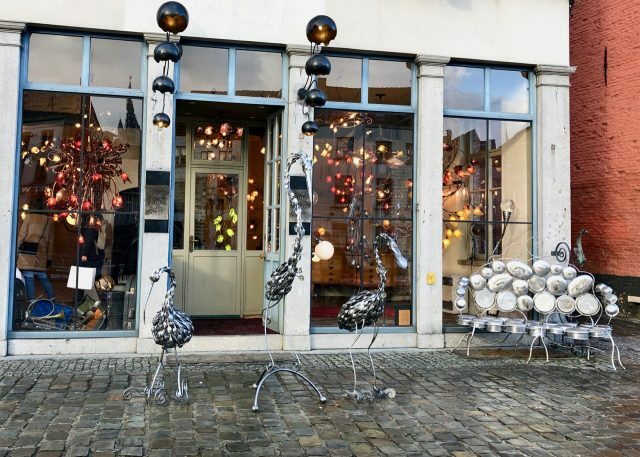 I also loved the quirky lamps in this shop. 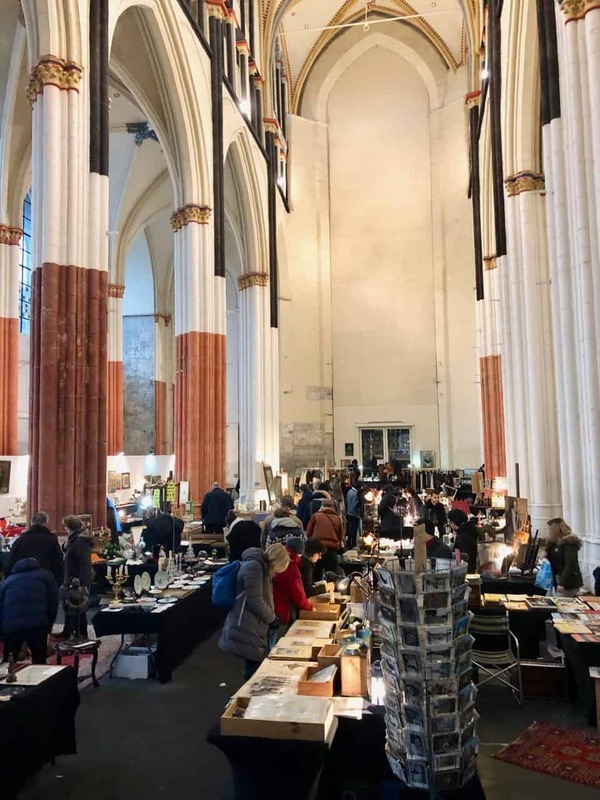 The antique market inside St. Nicholas Church. Flanders has a rich culinary heritage and Ghent is a great place to get acquainted with Flemish cuisine. If you love fries, you’ll love the Flemish ‘frites’. Head for De Frietketel (Papegaaistraat 89) or Frituur Tartaar (Heilige-Geeststraat 3) for ‘frites’ and a ‘kroket’. For an introduction to Flemish cuisine (in a contemporary ambiance), book a table at Meme Gusta (Burgstraat 19) for delicious slow-cooked stews and meat in a hearty beer sauce. Another restaurant that serves fabulous local cuisine is Brasserie Het Pakhuis (Schuurkenstraat 4; located in an old warehouse). 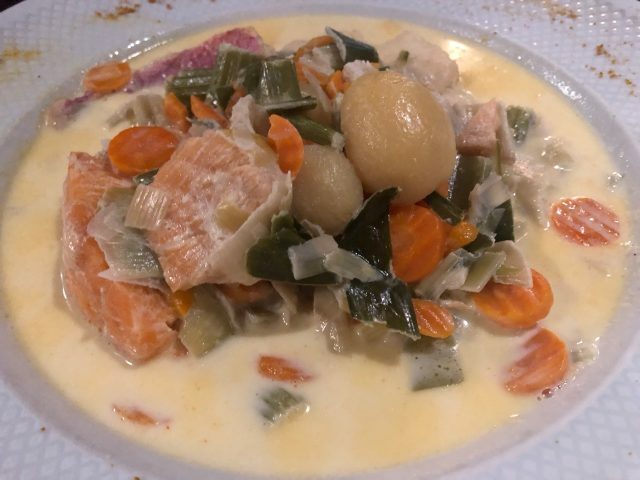 One typical Ghent dish to try is ‘waterzooi’ or fish stew. We discovered an amazing restaurant just across the road from our hotel: Sint Jorishof (Botermarkt 2). 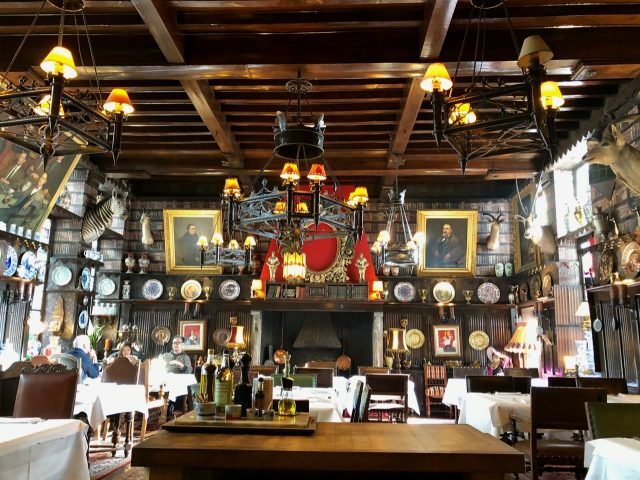 This medieval restaurant has a pretty overwhelming interior (there are just so many quirky things to look at!) and serves hearty Flemish food. I loved how each dish is paired with a suggested beer in the menu. For more eclectic international cuisine, check out Mosquito Coast (Hoogpoort 28) which is perfect for world travellers! Flanders is famous the world over for its beers and Ghent is the perfect place for a beer-tasting tour! 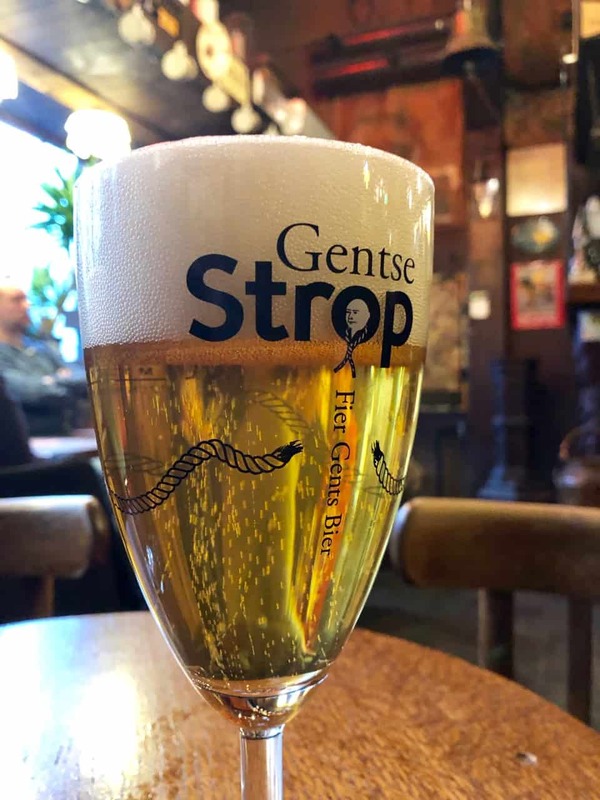 There are literally hundreds of beers to choose from so I recommend starting with something local and familiar such as the Gruut or Gentse Strop before moving on to the more distinctive beers. 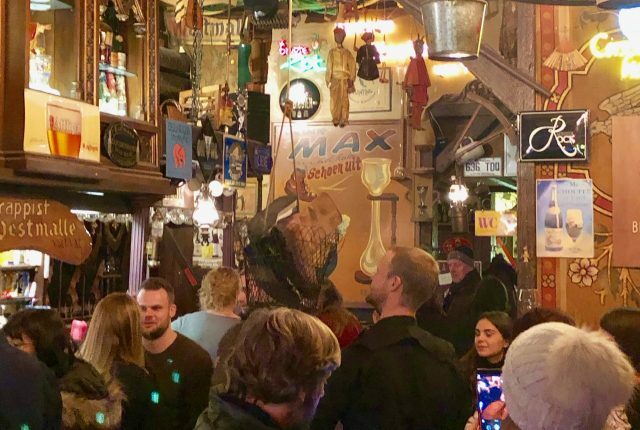 You can visit breweries such as the Gruut Brouwerij (Rembert Dodoensdreef 1) or pop into one of the atmospheric pubs such as the Café De Trollenkelder (Bij Sint-Jacobs 17) or De Dulle Griet (Vrijdagmarkt 50). 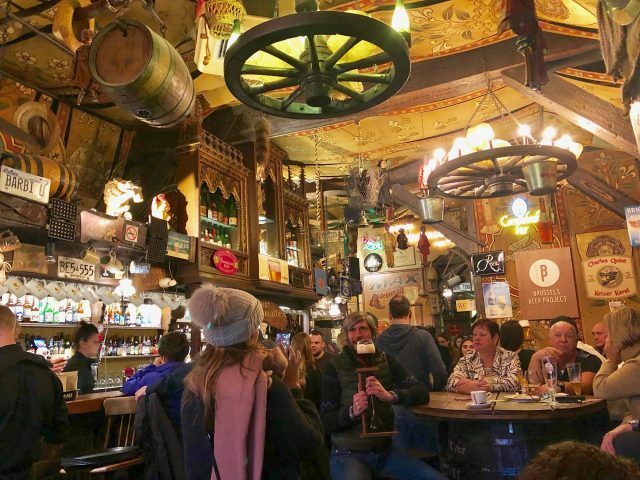 De Dulle Griet is a Ghent icon and is hugely popular with both visitors and locals. If you order a Max (which comes in a special glass), you’ll have to give the waiter one of your shoes, which is kept in a basket and hoisted up to the ceiling, as collateral! You’ll get your shoe back when you’ve finished your beer and returned the glass! You have to give the waiter one of your shoes, which is then placed in a basket, when you order a Max beer. Ghent can be easily reached by train from Antwerp and Brussels. It’s about an hour’s drive from Antwerp and Brussels, and about 2.5 hours by car or train from Amsterdam. I haven’t been to Bruges in a long time (probably 10+ years) so I can’t really compare. Back in the day (90’s/early-2000’s), Bruges was my favourite and Ghent was great for a quick stop. 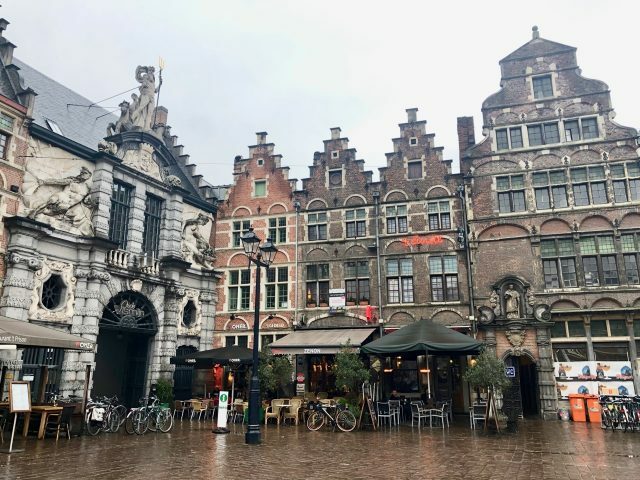 From what I hear, Bruges is very crowded/touristy these days and I must say, Ghent has spruced up very nicely and is definitely worth much more than a quick stop.